Top 10 Parks on My Bucket List! There are many amusement parks on my bucket list. I am going to visit a lot more amusement parks in 2019, which makes me super excited! Before I release my park travel plans for the year, I am sharing the Top 10 Parks on My Bucket List! I will release my travel plans video at the end of January on my YouTube channel. Please consider subscribing if you are interested in seeing that release. California’s Great America in Santa Clara, CA is a park that I have wanted to visit for a few years. Rides that look great from the park include Gold Striker, Flight Deck, The Grizzly, RailBlazer, and more. Overall the park looks to be great. Knott’s Berry Farm in Buena Park, CA has been appealing to visit for a few years now. It overall looks like an amazing park just in general. Rides that look to be awesome include Xcelerator, GhostRider, HangTime, Silver Bullet, and more. Six Flags Fiesta Texas in San Antonio, TX has been on my bucket list for just over 2 years now. Iron Rattler, Goliath, BATMAN: The Ride, WONDER WOMAN Golden Lasso Coaster, and other rides look to be awesome at the park. Canada’s Wonderland in Vaughan, Ontario is another great park on my bucket list. The park is known especially for their amazing B&M roller coasters. Leviathan and Behemoth are the star rides of the park, and they do not look disappointing at all. In addition to the rides, the park already has, in 2019, Yukon Striker will be making way to the park. It is a record-breaking B&M Dive Coaster. It will be a fantastic addition to the park! Silver Dollar City in Branson, MO has been on my bucket for the past year as I learned more about it and got more interested in the park. Rides that I am eager to ride at the park include Outlaw Run, Time Traveler, Wildfire, and all of the others the park has. In general, the park looks to be amazing! Hersheypark in Hershey, PA has been on my bucket list for a while now. Storm Runner, Skyrush, Great Bear, Fahrenheit, and other rides at the park look really good! The overall selection of rides and things to experience at the park makes it seem like a perfect place to visit! Kings Dominion in Doswell, VA is one of the parks that has been on my bucket list for a while now. I have wanted to visit it for over 3 years. Rides that look awesome include Intimidator 305, Twisted Timbers, Dominator, Racer 75, Grizzly, and more. The park looks amazing and I am planning to visit in 2019! Holiday World in Santa Claus, IN has been on my bucket list for over 2 years. It looks to be a really great park! Thunderbird, The Voyage, The Raven, The Legend, and everything else the park has to offer looks to be amazing! I am hoping to visit the park soon. Dollywood in Pigeon Forge, TN looks to be an amazing park with a ton of great rides, shows, and food. Lightning Rod, Wild Eagle, Mystery Mine, and all of the other coasters and attractions the park has looks to be a great combination and worthwile to visit! I am going to be visiting Dollywood this year and am super excited! Kentucky Kingdom in Louisville, KY is the Number 1 park on my bucket list. The reason is because I have wanted to visit Kentucky Kingdom for an extremely long time now. From the year the park opened, it has been on my bucket list. Storm Chaser and Lightning Run look to be amazing coasters! The park looks great and I am really looking foward to visiting it! Thank you so much for reading! I hope you enjoyed! I am really excited for more content on my blog! At the current point in time (January 2019), the current schedule will be a new blog post every 3 days. In additon, on the Coaster to Coaster YouTube channel, a new video every 4 days. I am hoping to carry this schedule out until the end of March. For February 2019 this will be the schedule and possibly for March. Starting in April, I do not think the same schedule will apply. Parks will be hosting events that I will be attending making it extremely hard to produce content that frequently. In 2019, I am doing a more balanced variety of content from various parks. In 2017 and 2018, the balance was not enough. There was too much content surrounding the same categories and parks. I have planned lots of posts for this year and they will be very different but exciting too! Thank you for your continuous support! Please contact me with any questions, comments, or concerns. That’s a nice top 10 bucket list parks. 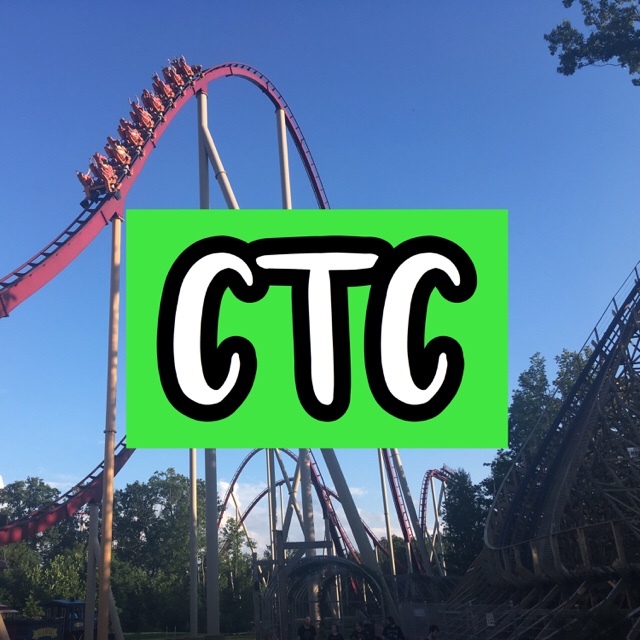 My top 10 bucket list parks are (in order), 1) Cedar Point, 2) Busch Gardens Williamsburg, 3) Six Flags Great Adventure, 4) Hershey Park, 5) Kings Island, 6) Six Flags Fiesta Texas, 7) Silver Dollar City, 8) Knotts Berry Farm, 9) Six Flags Magic Mountain, and 10) Six Flags Great America. I’ve already been to the southern parks so that is why none are in my bucket list. I hope you do get to visit Kings Dominion in 2019. I’m thinking that you won’t be as impressed with KD as I was simply because you’ve visited Kings Island, and they’re “sister parks”. You’re going to love I-305 though, and I was very impressed with Volcano and Dominator. Twisted Timbers was a very good ride but I honestly think it is over rated (just my opinion). You’re going to love Dollywood. It doesn’t feel like other parks, sort of like what STEVEH mentioned in his comment. Dollywood offers some very unique coasters and some great food (for a theme park). I know you didn’t mention Busch Gardens Tampa on your list but it is a park that you’d love. Overall, it’s probably my favorite theme park. The coasters and food are very good. Plus the animals are just fascinating. Their drop tower is just insane. It is a great park. Lastly, visit Six Flags Over Georgia sometime if you can. It’s probably the most under rated park in the country (just my opinion). Their coaster selection may not be the highest or fastest out there, but most of their coasters are very good. Their B&M Hyper is freakin awesome. I am looking forward to your views and opinions for the new parks that you experience in 2019. I think you’re going to have a blast at the new parks. Thank you. Your list is great as well. I hope I will be impressed when I visit Kings Dominion, but since I have visited Carowinds & Kings Island, I don’t think so. I know I will love I305, Twisted Timbers, Dominator, and Volcano. With Twisted Timbers, I have heard some people say that it was overrated but not many. It makes sense to me why that would be. I know I’m going to love Dollywood – the park is very well balanced and managed well. I am also planning on visiting Busch Gardens Tampa too. I am planning to visit Six Flags Over Georgia this year, actually. It was originally on my list but got taken out last minute. I have heard good things about all of these parks. I am very excited for 2019 as I will have more opportunities to participate and events and activities at amusement parks. I also am really enjoying the content I have produced this year, focusing on a variety of parks and chains. I am really excited for the 2019 season! I’m liking your content a lot more now as well. Some thought provoking topics. Thank you. I am always working more on continuing to generate new quality ideas. I actually just finished planning all of the content for February. Some interesting posts will be released that I think you will like. Since it appears you will be skipping the top two (Disney & Universal) chains entirely, I would like to see your views on property management as you will get a pretty good cross section of Cedar Fair, Six Flags, and several independent one-offs. Food, lodging, upkeep, perceived safety, and worker moral really define most of these parks. The entertainment, overall prices (food, games, souvenirs, and admission), and operations policy/styles vary greatly. I have visited most of the parks on your list and yes – you will experience a lot of legends when it comes to coasters, but surprisingly each park has its own personality that you take back with you after you leave. I am curious on how they compare to mine. I have been to many parks in the Disney chain. I am planning on visiting parks in the Universal chain in the near future. I did not include all of the parks that are on my bucket list in this chain. I focused on listing the parks that are high on my bucket list for 2019. While I tried to focus on listing my views on just the rides at the park since I have researched a lot about them, I have views on overall property management for all operators and specific ones too. It would appear that I am not mentioning my views or disregarding them, but the purpose of this post was not for that. I would normally put more focus on property management in a review for a park or when I am talking about strengths and weaknesses. I also have shared topics similar to that nature in some My Thoughts posts. I have never discussed park management on a countdown post. I think what you mentioned makes a lot of sense, and I have not taken that into consideration when writing this post. Part of the reason, however, is that I have heard things about the property management of these parks. Since I have not visited them, I cannot exactly list my opinions. In February, I am going to write a few posts about property management for the large chains (Cedar Fair, Six Flags, Disney, Universal, Busch Gardens, Sea World) and also for individual parks as well. I also probably will recreate this list solely on the management side of things, or perhaps, make a countdown list of the best property managements using chains and induvidually operated parks. Next10 Tips for Visiting Michigan’s Adventure!